Appy Couple is the most stylish and magical platform for engaged couples to create their own online digital sharing suite (wedding app, wedding website, emails) blending design and technology in one intuitive package for your perfect wedding. 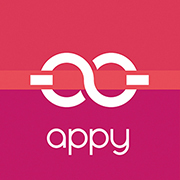 With Appy Couple, you can ensure that guests have everything they could possibly need at their fingertips and stay socially connected—no more patched together solutions of DIY websites, photo sharing apps, social networks and email invitations: Appy Couple puts it all-together. Download the app for free in the App Store or Google Play to view a demo app.